This busy market town is located at the confluence of five deep valleys along the River Frome. Although not one of the most attractive of the Cotswolds towns, it has retained some of it's 18th century character, despite extensive industrialization over the years. The town is a commercial center for the area and has a good selection of shops, eateries, galleries, antique shops and a fine museum. It is known as a centre for contemporary arts and hosts a number of colourful art festivals. The large bustling shopping centre is centred around a pedestrianised High Street. It has a wide range of commercial and independent shops, some with interesting upper-story stone facades. At the lower end of the High Street is the 'The Shambles'. Once a traditional meat market, it now sells a much more interesting range of produce, comprising mainly arts and crafts stalls. 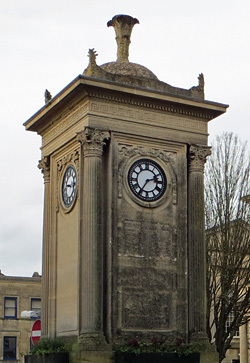 At the top of the street is 'The Cross', the site of the former Cornmarket, where a carving of ram with a bolt of cloth and a waterwheel, symbolises the origins of Stroud's prosperity. Stroud holds one of the finest outdoor farmers markets in the country, where colourful stalls sell a wide range of goods. Located in Cornhill Market Place and the surrounding streets, it runs every Saturday from 9 am to 2 pm. The market has been awarded Best Farmers’ Market in the UK, several times over by FARMA. There are several fine Civic buildings in the town. The four-faced Sim's Clock (circa 1920), stands near the neoclassical Subscription Rooms of 1833. An important entertainment venue, which hosts year-round performances, exhibitions, classes and markets. Alongside this is a fine Congregational Chapel, erected in 1835-7 by Charles Baker of Painswick, which still offers traditional Bible based church services. Stroud Parish Church of Saint Laurence (located in the centre of the town), is mainly a 19th-c reconstruction, built around an original 14th-c tower. The interior is one the finest of any of the Victorian town churches in the Cotswolds. In the churchyard lies the grave of Lieutenant Joseph Delmont, killed in 1807 by a fellow officer, in what was the last recorded duel on British soil. Stroud has a long history of wool and cloth manufacturer, powered by the clear streams that run down its steep valleys to join the Frome. It became the centre of the wool industry in the 15th-c. It became fully industrialised in the 18th/19th centuries, when the valley was dotted with over 150 factories and mills. As decline set in most of this manufacturing moved away, leaving only a few major companies producing high quality cloth for billiard tables and dress uniforms. The Stroudwater navigation, once used by the wealthy wool merchants to transport their goods worldwide, is currently undergoing a slow restoration. The canal was once linked-up with the Thames and Severn navigation, providing access to the Severn Estuary and from there on to global markets. The waterway closed between 1927 and 1941. Details of its long history and restoration can be discovered in the Cotswolds Canals Trust Visitor Centre. 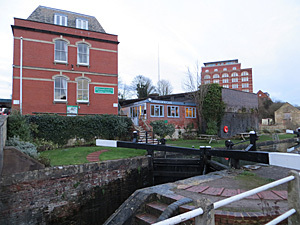 Wallbridge Lock, Stroud, GL5 3JS. Open from 10am to 1pm Monday to Saturday throughout the year. The use of canal declined following the introduction of the Great Western Railway in 1845. A restored goods shed (circa 1845), near the station, is by Isambard Kingdom Brunel. Excellent walking country can be found alongside the route of the canal and the Frome valley. 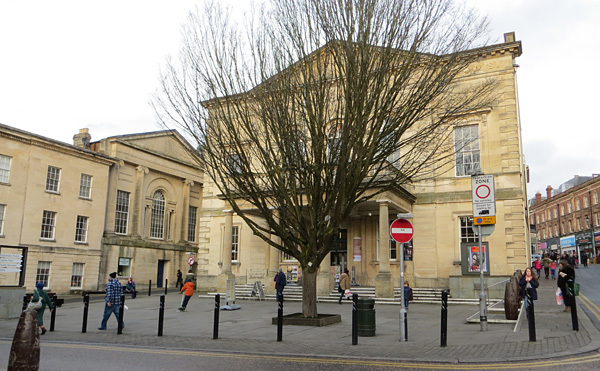 The Stroud District Museum (located in Stratford Park) provides an insight into the history of the town and its surrounding area. There are exhibits on local crafts, geology and industrial archaeology. Also among the displays is a collection of historic lawnmowers, designed by Edwin Budding, the Stroud based inventor of this labour saving device. Facilities also include a gift shop, cafe and walled garden.